On my fiftieth birthday, Garry and I went to New Orleans. It was a gastronomic delight. Every place we ate was better than the last, including the breakfast bar on the corner and the hamburgers in the gin joint down the street. From the moment we got on the airplane and headed south, we focused on where we’d eat as well as trying to figure out where to drink and listen to music. Everyone on our flight was doing the same thing. Turned out to be simpler than we expected. We handed our list to the concierge. He worked out the schedule and made the reservations. Nice!. This is the Hotel De La Poste in which we stayed. It wasn’t ritzy when we were there. I guess it has been “upgraded.” I liked it fine the way it was. One event would not take place at a restaurant, though dinner was included. The trip down the Mississippi on a paddle wheeler which we were going to do on my birthday. It was my 50th and our official excuse for being in New Orleans. We had planned the boat trip for The Big Day. Let me get right to the point. It was the only experience in the whole week that wasn’t great. Every other thing we did — from the tour of the swamps where we met the alligators, to each meal we ate — met or exceeded our expectations. The cuisine was exquisite, the service was warm, friendly, and efficient. There was music in the air everywhere. The drinks were big, strong, and delicious. Unlike the real world, you could walk around the streets with a tall drink in your hands and no one would care. Probably because they were clutching similar beverages. It turned out, the paddle wheeler wasn’t a paddle wheeler. In the sense that it didn’t have a paddle wheel. When I asked where the paddle wheel was, the “guy” explained that there weren’t enough people booked this trip to bring out one of the big boats that had paddle wheels, but this was a steam boat. So what was my problem? I wanted the paddle wheel. I felt cheated, but I was coping like an adult. Until they lined us up — just like kids in a school trip — and marched us to the steam trays. Where they had the limp vegetables, mystery meat, jello (take your pick, red or green), and a few other anonymous items that invited me to move on. 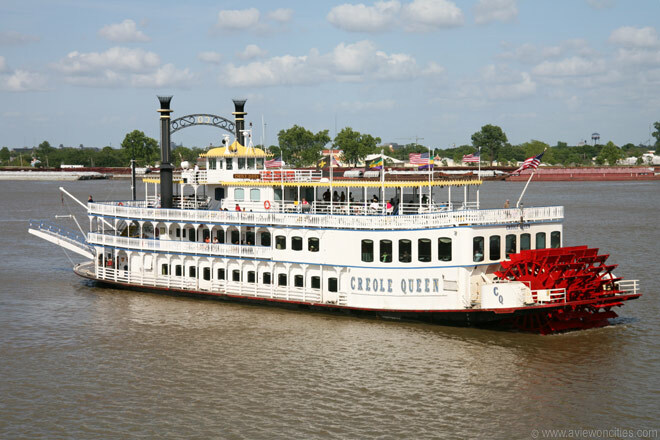 If your future plans include a trip to New Orleans — and it should — make sure your paddle wheeler has a paddle wheel. Bring a picnic lunch. Or eat before (or after) your excursion. Don’t eat their food, even if you are hungry. Trust me. I wouldn’t lie to you. How disappointing! 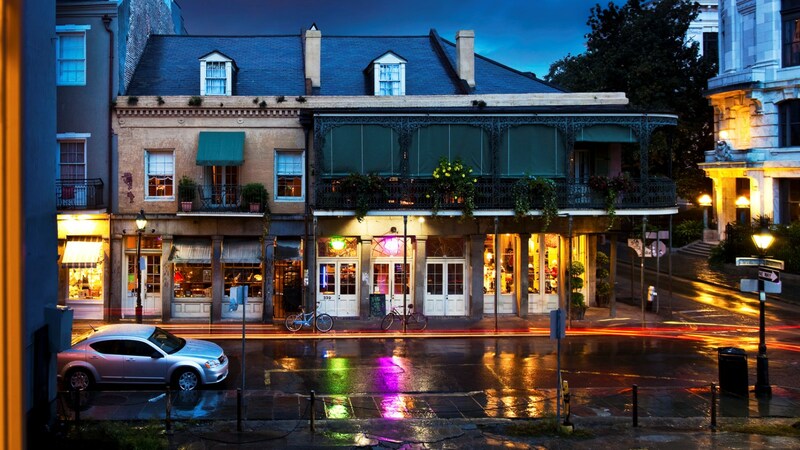 I’ve never been to New Orleans, though I am not sure I would enjoy it — not a drinker, alone in a night city, doesn’t quite appeal! Forget the drinking. The music! The food! The music AND the food. All the food. And then, there’s the music. Well that sounds better than any other descriptions I’ve heard! There were live bands everywhere. At breakfast, lunch, and dinner. On the streets. One place was free. They played music, read poetry. And if you wanted it, you could get coffee. THAT was great, too. Really, some of the best food in the world is cooked in New Orleans. I’m not much of a drinker and never was, so for me, it was an eating experience. By our third day, we realized we simply couldn’t eat another full meal, so we went down the road and ate at a bar. THAT was great, too. And oh. The music. Sounds enticing — safe for a woman alone? The place is crawling with tourists. Literally crawling. The city is born to make you happy. We stayed IN New Orleans. Garry and I didn’t feel comfortable hanging out in the countryside. The city is fine … probably so is the country, but we’re a mixed couple and we chose to stay safe. Interesting that we all have our individual safety concerns. My instinct would say that the countryside would be safer than the city, but then my concerns are quite different! Maybe a tour would work best for me. We went to see the alligators which was a tour, but I wasn’t particularly interested in rural Louisiana. Garry does not like the deep south and I have my own issues with it. Besides, New Orleans has all the fun stuff. That is a trip I would like to make. New Orleans only exists in books and films for me. It must have its own atmosphere. I think their cemetery must also be interesting. Aw, sorry, but on the positive side, better that one meal was bad and the rest of the trip great than the other way around.. It was a great vacation. Five days and I thought I was going to explode by Day Three 😀 I wish I hadn’t dropped my camera at the airport. Sort of eliminated photography! That is a place I would love to visit too and yes I would have been disappointed if my paddle wheeler was not the real deal. Right. I think a paddle wheeler should HAVE a paddle. I’ve watched all those movies about riverboat gambling and ALL those boats have a paddle wheel. And the food was like high school cafeteria level. I could have coped with the bad food, but without the paddle wheel, I felt cheated. damn, but if you pay for a ride on a paddle wheeler you should get one. It’s like going on a train trip and finding out it’s really a bus with cars attached. Noooo. It was VERY much like that and they didn’t even blow the horn to try and make up for it. But the rest of the journey was a delight. It is a great place to visit, though not everyone wants to try out alligator sausage. Garry is more adventurous than me. But all the rest of the food, no matter what you ate, was kind of amazing. Ordinary food wasn’t ordinary. And I loved the music. What a wonderful way to celebrate your birthday. I wonder if New Orleans has changed much since Katrina? New Orleans — OUTSIDE the “old city” — has apparently changed completely. The old part of the city where we stayed was never underwater. It’s up on a hill … which is where the entire city should have been. So sad what happen there. Horrible. Louisiana is a beautiful state. We had concerns because Garry and I are a mixed couple, but the state is gorgeous and the people are unique. Cajuns and Creoles and Acadians … what a wonderful mix of people they have. I think it’s probably a safe enough place if you are “from around there,” but a couple of Yankees like us … well … we are the right wing’s worst nightmare. We lived through the 1960s and a lot of bad things happened from which we never really recovered. So we needed to stay away from anything that reminded us of that and rural southern states — ANY rural southern states, were NOT on our agenda. They still aren’t. We’ve driven to Virginia because we have family there and to see historic sites and one hell of an amusement park outside of Williamsburg — the BEST roller coaster anywhere I think. But even during the drive down, we were careful. Very careful. My first husband — the whitest man on earth — and I drove from NY to Florida as our honeymoon. We took almost 6 weeks to do it, too. Stopping everywhere along the way. It was 1965 and there were some very scary places along the way. And the scariness came up simply because we were from New York. Imagine if it was Garry and I. We drove to Florida one time around 1970. We had three young babies, one still in diapers. It was quite an eye opener then. Peter is part Acadian, not sure that would have made much of a difference. No, I think they just don’t love Yankees. But they might love Canadians. On the drive down I got the feeling it was just that we were strangers and they weren’t too partial to strangers. Previous Previous post: HAS ANYTHING CHANGED?